Of the 20,000 species of bees in existence, not all live in the same areas. That means that some species of bees found in Africa might not live in Europe or America. As a result, not every species of bees can be found on every continent, making for some variation in habits, size of colonies and behavior. 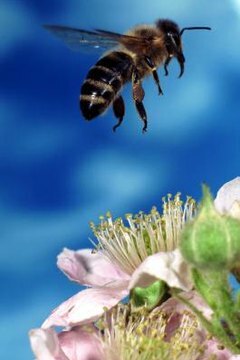 The honey bee is the most abundant and common type of bee, spread almost everywhere in the world. Antarctica is the only continent that's completely devoid of any bees. Of course, with temperatures reaching as low as minus 76 degrees Fahrenheit, not many living things can survive down there. In fact, most of the insects living in Antarctica are parasites -- the kind that lives in the fur of sea animals or birds. Bees thrive in tropical climates. What that means is that even without a continent, you might find a higher concentration of bees in warmer countries -- and even in warmer states or provinces within that country. In the US, for example, honey bees are concentrated in the southern states, which are warmer year round. The honey bee originated in Africa. From there, the honey bee migrated to Europe and was later introduced to America by pilgrims, who brought them over to produce honey. As a result, Africa has the oldest colonies of bees in the world. African bees also tend to form smaller colonies and spread out faster, nesting in tree branches and other open spaces. Because of this, there's usually more bee nests in Africa than in Europe, where bees nest in larger groups and search for protected locations, usually away from open spaces and people. To survive, bees need an environment that contains insect-pollinated flowering plants. Lush, tropical environments make good living places for bees because they are most likely to have a variety of flowers that bees can feed on. This is why bees can't survive in Antarctica -- there are no flowering plants there. Desert bees do exist, but they are rare and have adapted by living dormant for months at a time under the desert soil, only emerging after heavy rains that cause desert flowers to come alive.